Because RVs often get taken out into nature and then left in storage for long periods of time, they all tend to have one common problem: pests. If you’ve ever owned an RV you almost certainly know what we’re talking about. From ants to mice, little creatures love to make themselves at home in your tiny home-on-wheels. 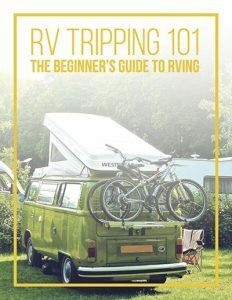 Therefore, knowing the ins and outs of pest removal and prevention is of the utmost importance when you’re an RV owner. Whether you’re dealing with this issue right now or wanting to avoid it entirely, you’ve come to the right place. Here in our pest control guide, we have all the information you need to keep your camper bug- and rodent-free. Let’s begin by discussing ants. These tiny intruders are quite possibly the most common of the RV pests. There are a variety of ants out there, and we’ve seen all shapes and sizes settling down in RVs. However, none of these types of ants should be welcome in your rig. Here are some ant control tips for ensuring they stay out. Put food away — Ants eat what humans eat. Therefore, they are attracted to food. Keeping your food well sealed, cleaning up spills as soon as they happen, and taking out the trash often can all work wonders when it comes to preventing ants. On top of that, you’ll want to remove all food from the RV when it is in storage. Sprinkle cornmeal — If you pull into a site and notice ant hills, go ahead and get practice by sprinkling cornmeal near their mounds. They will feed this to their queen, which will kill her and consequently the entire colony. …and Comet — You can also sprinkle Comet cleaner on your jacks and anything else that touches both the ground and your RV. The Comet will work as a repellent, keeping them from climbing onto and into your rig. Set out peppermint — Ants hate peppermint. Simply setting out some peppermint essential oil-soaked cotton balls here and there throughout the camper should help keep them away. Mice are another common problem, and these little buggers can be pretty destructive if they aren’t stopped quickly. Therefore, keeping the rodents out of your rig entirely is preferable. Seal the food — Once again, food that is left out—or trash that isn’t taken out right away—can be a major player in attracting mice. Additionally, mice are great at eating through paper and soft plastic packaging. For this reason, you might want to consider storing food in hard plastic containers and removing it when you put the rig in storage. Try peppermint again — That peppermint trick mentioned above? It works as a rodent repellent too. All the more reason to diffuse peppermint oil and keep those peppermint-soaked cotton balls around. Close up any holes — Mice can fit through holes as tiny as a pen. For this reason you’ll definitely want to plug any and all holes into your trailer or motorhome, no matter how small. Toss in some mothballs — If you keep things in the storage bay of your RV, throw some mothballs into the storage bins. The smell may not be great, but they work great as a mouse repellent. If you do happen to end up with ants, mice, or any other pest problem, you may want to look into professional pest removal. The cost of such services varies widely, and can be quite expensive. For instance, a bed bug exterminator may charge as much as $1,500. However, if your problem is bad enough, this might just be money well spent. Don’t have several hundred dollars to spare for professional removal? There are some DIY options you can try first. Indoor Bug Zapper — If your issue is with flies, moths, or any other flying bug, an indoor bug zapper might just solve the problem. Laundry — Begin by washing all of your bedding (pillows included) in hot water and running it all through the dryer on the high heat setting. Don’t take it back into the RV until you’re certain the bugs are gone. Vacuum — While that’s washing, vacuum all of the furniture, making a point of getting into all crevices. Do not empty the vacuum in your RV. Instead, go as far from all RVs and homes as possible. Use Pesticides — Put bed bug-specific pesticide in all cracks and crevices and let it all sit for a few days. Plastic Coverings — If the bugs are stubborn, you might consider sealing all of the furniture tightly under a layer of plastic and leaving it covered for a year. This will starve any remains bugs. 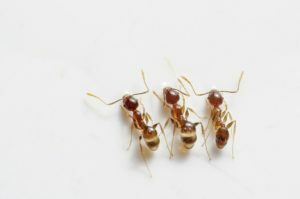 Boric Acid Ant Killer — Boric acid ant killer works in essentially the same way as the cornmeal mentioned above, but is perhaps a more aggressive defense against ants. Chemical Bug Sprays — Chemical bug sprays aren’t great for human health, and should be used sparingly. However, if you have a serious ant problem, using one of these sprays in addition to the boric acid ant killer mentioned above, you should be able to get rid of the little bugs. 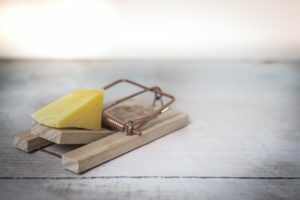 Mouse Traps — Sticky traps or snap traps will help on your mission to get rid of mice. Place these in numerous places throughout the rig and be sure to check them regularly. 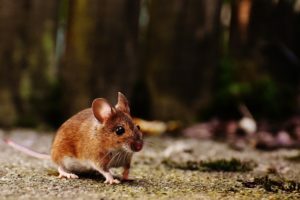 Mouse Poison — If you don’t mind dealing with the smell of a dead mouse in your rig for a while, rodent poison can also be an effective way to get rid of these rodent pests. 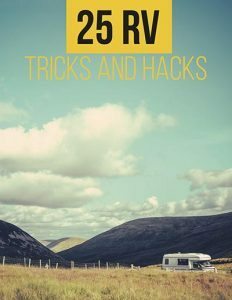 By using these DIY methods for getting rid of pests and implementing the prevention methods at the top of this article into your RV maintenance schedule, you should be able to keep the bugs and rodents at bay so you can fully enjoy the camping experience.